‘Unconventional geothermal’ a game changer for U.S. energy policy? SMU geothermal energy expert David Blackwell gave a Capitol Hill briefing Tuesday, March 27, 2012, on the growing opportunities for geothermal energy production in the United States, calling “unconventional” geothermal techniques a potential game changer for U.S. energy policy. Blackwell’s presentation outlined the variety of techniques available for geothermal production of electricity, the accessibility of unconventional geothermal resources across vast portions of the United States and the opportunities for synergy with the oil and gas industry. Also speaking at the briefing were Karl Gawell, executive director of the geothermal energy association, and James Faulds, professor at the University of Nevada-Reno and director of the Nevada Bureau of Mines and Geology. The session was one in a series of continuing Congressional briefings on the science and technology needed to achieve the nation’s energy goals, titled collectively, “The Road to the New Energy Economy.” The briefing was organized by the National Science Foundation, DISCOVER Magazine, the Institute of Electrical and Electronics Engineers (IEEE) and the American Society of Mechanical Engineers (ASME). Senate Majority Leader Harry Reid of Nevada was honorary host for the March 27 briefing at the Senate Visitor’s Center, which included congressional staffers, members of science and engineering associations, government, private and industry representatives. SMU’s geothermal energy research is at the forefront of the movement to expand geothermal energy production in the United States. 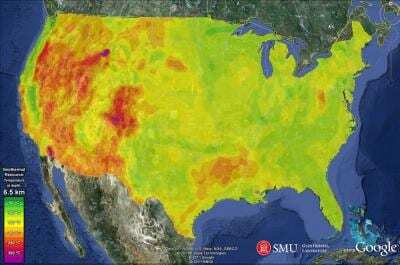 Blackwell and Maria Richards, the SMU Geothermal Lab coordinator, released research in October that documents significant geothermal resources across the United States capable of producing more than three million megawatts of green power — 10 times the installed capacity of coal power plants today. Sophisticated mapping produced from the research, viewable via Google Earth, demonstrates that vast reserves of this green, renewable source of power generated from the Earth’s heat are realistically accessible using current technology. Blackwell noted the potential for synergy between geothermal energy production and the oil and gas industry, explaining that an area previously “fracked” for oil and gas production (creating an underground reservoir) is primed for the heating of fluids for geothermal energy production once the oil and gas plays out. Blackwell closed his presentation with acknowledgment that site-specific studies and more demonstration projects are needed to make geothermal energy a strong partner in the new energy economy. The briefing was taped and will be posted to the Science 360 website hosted by the National Science Foundation at a later date.